In about 1986, I purchased a Science Fair Microcomputer Trainer (MCT) from my local branch of Tandy (in Cheshire, UK). The machine was sold by Tandy shops, it was one of their 'wire-it-yourself' project kits and ran on 6 penlight batteries. I recall that my older brother wired it up for me, but we never really had much success with it, although we enjoyed playing the built-in games (including tennis and rat-bashing) and programming tunes in. Ironically, it wasn't until years later that I actually had any success programming it. It had a set of about 30 commands (15 simple, plus some 'extended'), which were entered through the keyboard. The keyboard suffered badly from switch bounce; increment would sometimes be registered twice, causing much annoyance. The CPU (or rather MCU � Micro Computer Unit) was a Texas Instruments TMS1100. 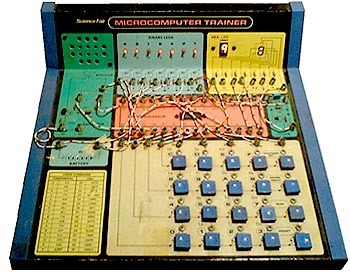 This was an expanded version of their flagship "computer-on-a-chip"; the TMS1000, which was used in their "Speak and Spell" toy. According to the MCT manual, the clock speed was 400kHz � but this is higher than the specification for the chip! (Were Science Fair guilty of over-clocking!?!). Presumably the monitor was burnt into ROM � the 30 commands the end user uses being interpreted. There was no bulk storage: programs were lost when power was removed, so had to written down manually. (I did consider driving the keyboard from my Sinclair Spectrum so I could save/edit programs before 'downloading' them to the MCT, but never got around to it). The most fun I had with it was when I wired three address LEDs to control a toy drum machine. I then wrote a program that would play an eight-note tune (wow!) in time with a beat from the drum machine. The manual contains instructions for the built-in games and example programs (complete with flowcharts). Some of the example programs are quite complicated (given how tedious entering them would have been). A �Slot Machine� game comes with a disclaimer: This �slot machine� behaves very much like those that you see at amusement arcades. But you can only play it for fun � the Microcomputer Trainer has not been programmed to give cash prizes. � no kidding! I think they overclocked the TMS1100. I checked the internet and it's top speed was 300khz it was an expanded version of the TMS 1000. Made in early 1975 it's memory was ROM 2KB RAM 64 bits. It was a PMOS or MCU . it took 43 standard instructions and 1024 micro instructions.So truly i think they overclocked it by mistake or to sell it but anyone i've only had a chance to see one open but not play with it.tooo bad looked intresting. see more Science Fair Microcomputer Trainer Ebay auctions !